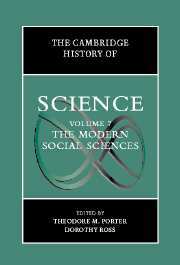 Edited by Theodore M. Porter and Dorothy Ross, The Cambridge History of Science Volume VII: The Modern Social Sciences (2003) is the last of the current seven volume series. There is, however, a forthcoming eight volume, entitled The Cambridge History of Science Volume VIII: Modern Science in National and International Contexts, edited by Ronald L. Numbers and David Livingstone. The volume under consideration examines “the history of the social sciences over some three centuries and many countries, attending to their knowledge and methods, the contexts of their origin and development, and the practices through which they have acted on the world.” Part 1 discusses the origins of the social sciences; Part 2 on modern disciplines in “western Europe and North America since about 1880”; Part 3 on the “internationalization of the social sciences”; and Part 4 consists of “a collection of case studies illustrating the larger importance of social science” in public and private life. My interests chiefly concern the contents of Part 1, and thus the following will concentrate there alone. The French Revolution of 1789, Porter asserts, “marked an important shift, in which social progress came to seem both more powerful and more threatening.” Voltaire, Rousseau, Condillac, Turgot, d’Alembert, and Diderot all died between 1778 and 1784. “In the politically polarized climate after 1789, a career like that of Voltaire or Diderot, based on appeals to universal reason, was scarcely possible.” “Unruly passions,” Porter notes, “inspired a pervasive sense of danger,” which in turn gave way to a more urgent social science, “often more ideological, looking to the past, or to science, in order to comprehend what seemed the precarious circumstances of modernity.” In this sense, the social sciences moved beyond understanding to administration, particularly under the monarch. “The state, henceforth acting on the basis of full information and rational methods, would naturally advance the public good.” This was a social science in utopian form. Comte initiated a massive effort to define the methods and historical progression of the sciences. His main purpose was to announce the discovery, and define the standing, of sociology. He rejected decisively the idea that social science should adopt the same methods as astronomy, physics, or physiology. Yet at the same time he defined a hierarchy of knowledge, with social science dependent for its formulation on all the sciences that had gone before. And despite his claims for the inclusion of social knowledge, he made of “science” something special and exclusive. There had been, he argued, no science of physics before the seventeenth century, no true chemistry before Lavoisier. The origins of physiology were still more recent, and the founder of scientific sociology was, to cast aside false modesty, himself. Theology and metaphysics were not part of positive science, but its predecessors and its antithesis. Law, literature, and rhetoric could never occupy this hallowed ground. Thus, while Comte formulated his philosophy in order to vindicate sociology and to define its place within science, he insisted also on a highly restrictive sense of “science,” a standard the social sciences could not easily meet. Statistics became the characteristic social science of the mid nineteenth century, and was carried out largely by officials of the state. “During the 1830s, many of the leading nations of Europe…created permanent census offices.” According to Porter, this effort by the states were “very much a part of the history of social science, not only because they provided indispensable sources of data, but also because their leaders often took an active role in interpreting the figures—which often mean propagandizing for public education, for example, or for improved sanitation.” This movement was not without its critics, particularly when statistical data become closely associated with laissez-faire political economy. The “naturalistic quest for knowledge of human nature and human society,” Heilbron tells us, was initiated by natural law theorists such as Hugo Grotius (1583-1645), Thomas Hobbes (1588-1679), and Samuel Pufendorf (1632-1694), who “developed elaborate systems of moral duty and political obligation based upon what they took to be permanent features of human nature, such as the concern for self-preservation.” Invoking natural science involved use of mechanical metaphors, the primacy of observation and experience, measurement and quantification, and rational deduction. But such a process was neither uniform nor uncontested. During the Enlightenment period, the “secular intelligentsia,” Heilbron writes, “explicitly claimed, and effectively exercised, the right to analyze any subject matter, however controversial, independent of established authorities and official doctrines.” Discourses on political, moral, and economic issues relied on “factual evidence and detail” provided by the natural sciences. This is the first of three distinct trends that Heilbron wants to point out. The third trend was the opposition of prevailing forms of naturalism in the human sciences. Heilbron claims that the elaboration of “humanistic or cultural alternative made natural science, with its insistence on mechanical laws and causal models, an object of criticism.” Heilbron never expands on this third trend, so what he means here is not entirely clear. But the “promise and prestige of the natural sciences,” Heilbron tells us, “did not remain uncontested. Countermovements to the naturalistic understanding of human society became an intellectual force in the course of the nineteenth century,” particularly in and through the writings of Johann Gottfried Herder (1744-1803). Herder argued that “each society, each people, is marked by a peculiar cultural spirit, a Volksgesit, expressed in its customs, myths, and folktales [and] the task of the human sciences is to uncover the peculiarities of this spirit.” According to Heilbron, Herder’s work “contributed to an emerging culturalist understanding of human socieites,” reinforced by the Romantic reactions of Chateaubriand, Coleridge, Wordsworth, Carlyle, and Bonald, among others. The following essays examine the same movements and figures, only in more concentrated areas. Stephen Turner, for example, focuses on the “ideas of cause and teleology before and during the period of Mill and Comte, and its aftermath up to the early twentieth century.” Although Enlightenment thinkers agreed that arguments of teleology were problematic, “they were impressed with the idea that organisms are understandable only teleologically, only in terms of some internal principle or nature that cannot be reduced by mechanism; and they relied freely on the idea of human nature, characterized by inherent purposes, in their political reasoning.” Turgot, Comte, and Mill all wanted to eliminate final causes in their social sciences. But teleology survived the onslaught by these writers, in the form of purposive language, organic analogy, and historical directionality. As Turner concludes, “the project of stripping science of its teleological elements was difficult, perhaps impossible to carry through consistently.” Indeed, teleology persists today in many forms, particularly in rational choice theory in the social sciences. Antoine Picon examines “Utopian Socialism and Social Science” during the nineteenth century. Under the direction of the “founding figures of utopian socialism” Saint-Simon, Charles Fourier (1772-1837), Robert Owen (1771-1858), and their disciples, a scientific understanding of society was a “prerequisite for its reconstruction.” The notion of progress was a key piece of utopian arguments. Whereas Thomas More’s (1478-1535) vision of utopia was the negation of place—literally to be found “nowhere”—eighteenth-century utopias shifted from “singularity to universality, from nowhere to everywhere…[and] relocated into the future, as the final stage of human progress.” The utopian socialists’ vision of history, Picon tells us, “was based on the identification of a series of organic stages…separated by periods of cultural and social uncertainty and unrest.” Ironically, while eighteenth- and nineteenth-century utopians rejected Christianity, they had no intention of rejecting religion tout court. In fact, they wanted to replace Christianity with a new religion, a “religion of humanity.” Although the attempt to found new religions was eventually abandoned in the social sciences, late-nineteenth- and twentieth-century “sociological literature was permeated by a dull nostalgia for what had been lost,” as seen in the work of Max Weber and Émile Durkheim. The cult of progress; the belief in absolutely positive social facts and permanent historical laws that could reveal the future of mankind, were a crucial part of the emerging social sciences. Likewise, “Scientific ethnography and travel” in the eighteenth and nineteenth centuries, as Harry Liebersohn tells us, not only “facilitated accurate navigation over the thousands of miles of a world sea voyage”; it also opened a “new round of competition between the two great powers [i.e. British and French], who now played out their rivalry in the vast, hitherto imperfectly charted expanse of the Pacific.” Ethnographers of the late eighteenth and early nineteenth centuries did not simply transcribe their impressions of the things they have witnessed—rather, “they capture a many-sided drama involving actors across the world, all of them contending to dominate the ‘truth’ about encounters among strange people.” These were indeed “narratives of knowledge,” accounts of “independent-minded intellectuals who formed their own views of the things that they saw and…sometimes developed a belief that they were bearing witness to world-historical events for a European public.” The philosophes, for example, “drew on travel writing to validate their criticisms of politics at home and of colonial administration overseas.” The institution of slavery, equality, and liberty were a common topics encouraged by ethnographic works. Darwin, for example, in his 1839 account of the Beagle voyage, “attributed the wildness and poverty of the inhabitants of Tierra del Fuego to their insistence on an equal sharing of property and power, which checked, he though, any formation of a higher culture.” These works also encouraged comparative methods of inquiry, “evaluating the fantastic clutter of skulls, costumes, vocabularies, adventure stories, economic reports, and other souvenirs” of knowledge. This would led, as many other scholars have pointed out, to the development of comparative linguistics, but also the comparative study of religion. The Cambridge History of Science series is a massive and comprehensive undertaking. Beginning with Medieval Science and concluding with the Modern Social Sciences, the books serve as invaluable and indispensable references to the historian of science. I have found them valuable for orientating my thoughts and its judicious survey of movements, figures, and ideas. One must however carefully and selectively sift through their contents. Most of the essays are excellent; but many are also meandering, unfocused, and varying in quality. The cost of each book may also deter those looking to add them to their private library. Despite this, the series provides an incontrovertible resource for those interested in the history of science.